BOOK REVIEW: ‘Adani and the War Over Coal’ — a pox on both their Parties, Independent Australia John Biggs 30 September 2018 The story of the devious and secretive negotiations between Adani and Australian governments of both stripes is appalling, writes John Biggs. “…… Conservation groups, Indigenous people and, eventually, a strong majority of ordinary Australians are outraged. 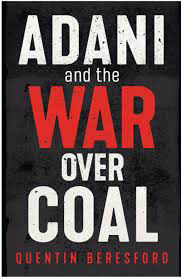 In this book, Dr Beresford brings his sharp research and writing skills to tell this story of the war over coal.Gautam Adani had close connections with India’s PM Narendra Modi, who protected Adani over environmental and human rights violations in India. Adani donated heavily to both major Australian parties, especially to the Coalition. The Abbott and subsequent Coalition governments pushed for Adani as hard as they could. At first, so did Labor, but then sort of didn’t, but if certain conditions are met, well, maybe . The major issues in dispute, as Bereford see it, are as follows. If all the Carmichael coal is burned – here or anywhere – the carbon emissions would be more than Australia already produces. That would likely tip global warming irreversibly. The pro-Adani group deny this. The Reef is already seriously endangered by climate change, drainage from fertilised farmlands, and starfish. The mine would make matters immeasurably worse, as dredging (authorised byLabor’s Tony Burke) has already indicated. Julie Bishop even denied the Great Barrier Reef would be in any danger. The Great Artesian Basin, vital for Australian agriculture, would be seriously endangered by the mine, either through using the water or by puncturing and draining the Basin. Adani supporters say this is exaggerated, and anyway coal mining is a thirsty business. Doongmabulla Springs is in the mining area and is of high cultural significance to the Wangan and Jagalingou peoples. However Indigenous Land Use Agreements (ILUAs) that favour developers have been foisted onto the locals. These are currently under appeal. The costs of mining coal are now higher than the costs of producing renewables — and the difference is rapidly widening. With Adani’s projected costs, current debts and likely returns, Adani is predicted to lose crippling amounts of money if it proceeds. First in India and now here, Adani operations have already badly polluted land in the Carmichael region. Given all of this, why on Earth would Australian governments be so determined to support the Adani project? Beresford discusses these issues and others in depth. His findings and assertions are fully referenced, his arguments convincing.